Entrepreneurship is an area that is dominated by men. According to the U.S. Census Bureau, more than 75 percent of businesses are male-owned. With such high numbers, it is sometimes easy to assume that men are more successful in owning and running businesses than women. But is it true? Our analysis reveals no. Though men might be starting and running more businesses, their revenues and job creation rates lag behind their women peers. In addition, women are more effective leaders, and they have a larger appetite for growth. We compiled data from the U.S. Census Bureau, Dow Jones, the Harvard Business Review and others to compare the success of female entrepreneurs to their male counterparts. Our analysis combined 10 private and public studies and determined that when you look at the statistics, the women outperformed the men. 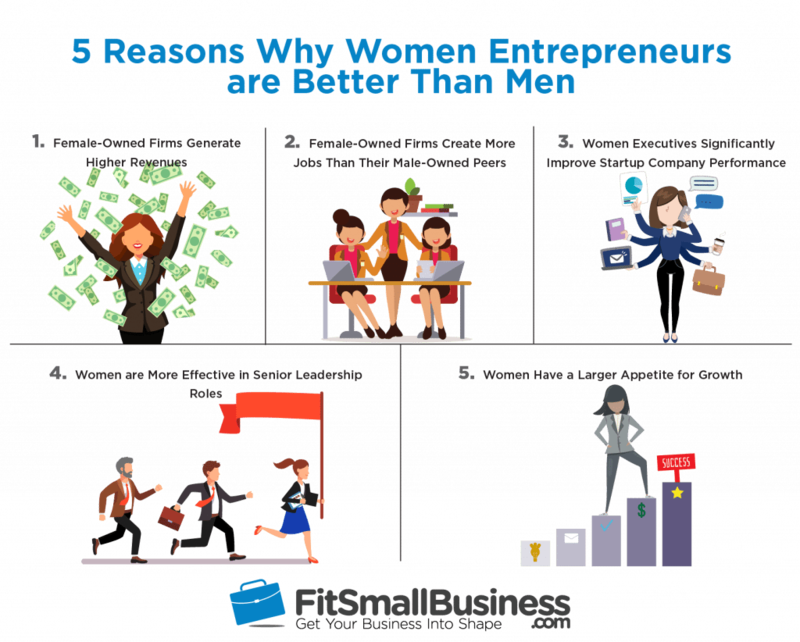 There are of course many ways to evaluate the success of entrepreneurs individually and in groups, but here are five data-based areas in which women can be considered better entrepreneurs than men. It is well-documented that male-owned businesses out-survive female-owned firms. In fact, businesses owned by men have a 75.1 percent three-year survival rate, compared to 69.5 percent for women-owned companies. But survival rate is not necessarily the true measure of success in entrepreneurship, as owners close their businesses for a variety of reasons that don’t necessarily mean failure. Some might voluntarily exit because they’ve sold the business, or some have managed to achieve their business goal and decided to close up shop. Others might have closed their doors because they wish to pursue a new lifestyle, and then there are some who just retired. In terms of generating profits and growing a company, at least one measure finds that women actually do that better than men. Womenable, a social enterprise firm focused on women’s entrepreneurship, analyzed the growth trends of male- and female-owned companies from 1997-2014, and found that businesses owned by women saw a 72.3 percent growth. Male-owned firms, on the other hand, grew by 45.1 percent over the same time period. Another solid measure of a successful business is the number of jobs it creates as jobs stimulate the economy by encouraging consumption and creating more business. Female-owned firms are light-years ahead of male-owned firms in this regard. According to the Census Bureau, the number of U.S. employees who work at businesses owned by men grew from 41.05 million to 41.20 million from 2007-2015, a meager 0.37 percent growth rate. Meanwhile, the number of employees at female-owned firms grew from 7.5 million in 2007 to 8.9 million in 2015 — a growth rate of 18.39 percent. Women-owned firms created 1.24 million more jobs during that eight-year span than their male-owned counterparts even though the latter run more businesses. This is because the number of firms owned by women grew by almost 20 percent as opposed to the growth rate of 4.86 percent of male-owned firms during the same time period. That’s not all, as annual payroll of female-owned firms outgrew male-owned companies. From 2007-2015, the annual payroll of businesses owned by women grew by 36.52 percent while male-owned companies grew by 16.54 percent. Not all businesses are solely owned by men or women. In businesses where men and women share ownership, one recent analysis suggests that one woman co-founder is enough to dramatically improve company performance. 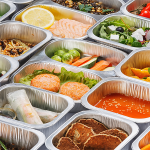 Seed-stage venture firm First Round analyzed 10 years worth of its investing data, made up of 300 companies and close to 600 founders and cofounders, to evaluate the characteristics of successful owners. One of the surprising things the firm discovered was that investments in companies with at least one female founder outperformed their investments in companies with all-male founders. 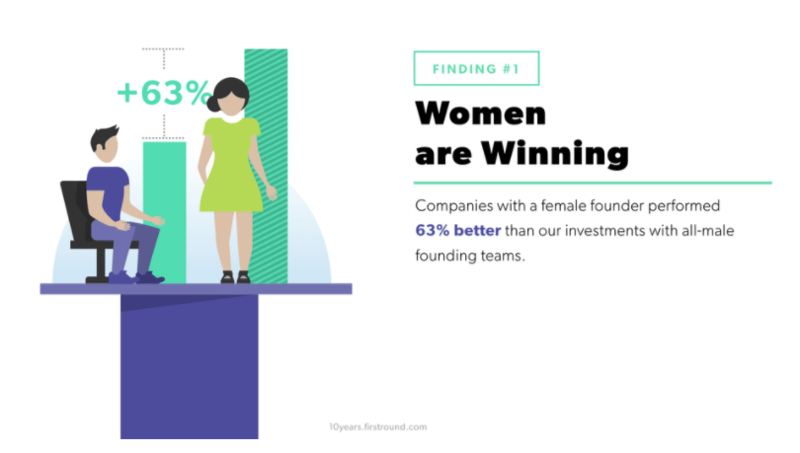 In fact, companies with a female founder performed 63 percent better than companies where founders are all males, in terms return on investment. It’s not just co-founders. Women executives also improve company performance. 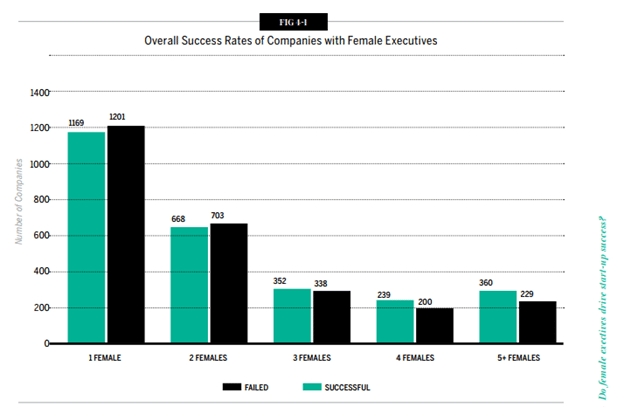 In fact, the more female executives, the higher the success rate. A longitudinal study conducted by Dow Jones VentureSource tracked more than 20,000 VC-backed companies in the U.S. that received funding from 1997-2011 to analyze the impact of female executives, including founders, in startup success. In this report, a company was considered successful if it is was currently profitable or was acquired at a higher valuation than its total venture investment. Companies that exited through an initial public offering (IPO) or were in IPO registration at the time the report was published were also considered successful. The study found that firms with three to four female executives had higher success rates compared to companies with only one or two female executives. More importantly, startups with five or more female executives had the highest success rate at 61 percent. Firms with the strongest leaders have almost double the revenue growth of businesses with weaker leaders, according to research company CEB. While men are often the top brass in many companies, it doesn’t necessarily mean that they are stronger leaders than women. In fact, research by the Harvard Business Review shows that women are more effective leaders than men in all positions of authority in a corporate setting. 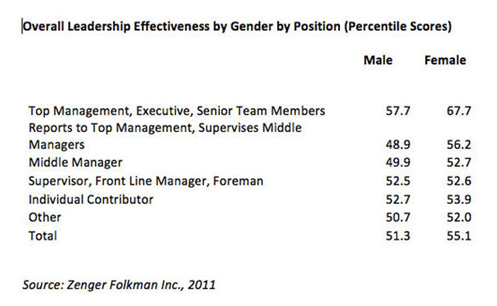 Women outperform men the most in top management positions including executive roles. The gap narrows with every step down the corporate ladder. 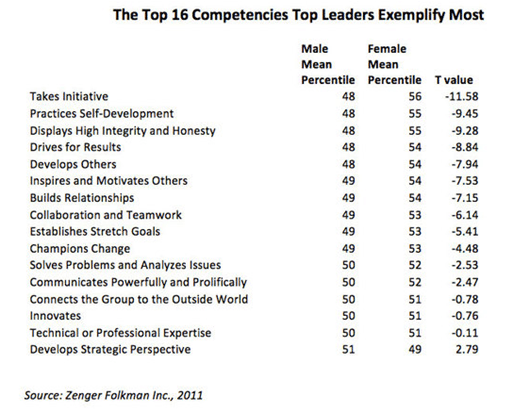 The research provided hard data on the key competencies that top leaders should exemplify. Out of 16 leadership competencies, which included problem solving, driving for results, and collaborating with others, women scored higher than men in all but one. Effective leadership has been known to improve the workforce productivity by driving for results and inspiring others. Strong leaders also help attract and retain top-caliber talent as they strive to build relationships while displaying high integrity and honesty. Ultimately, these leadership advantages all contribute to the company’s profitability. One of the key components of being an entrepreneur is the ability to grow a company. Growth may be measured in the form of expansion, additional employees, or new ventures, but all of these contribute to the entrepreneur’s net worth. 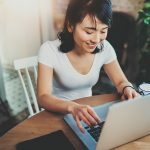 A BizWomen survey of 1,366 business owners revealed that 32 percent of female-owned businesses are in active expansion mode compared to just 27 percent businesses owned by men. Not only are women more interested in expansion, they are also more keen than men to start new ventures. A Centre for Entrepreneurs study of over 400 entrepreneurs and executives revealed that close to half of women polled plan to start another business within the next three years, compared to just 18 percent of men. While entrepreneurship is an area dominated by men, many studies suggest that women are often better in this discipline. The analyses we researched determined that female-owned firms generate higher revenues, create more jobs, and perform better in terms of providing investment returns. In addition, women are more effective leaders and have a larger appetite for growth. What are your thoughts on our analysis that women are better entrepreneurs than men? Feel free to share your comments below.